The first time we made African Chicken Peanut Stew was the day Shelby and I discovered Penzey’s Spices. 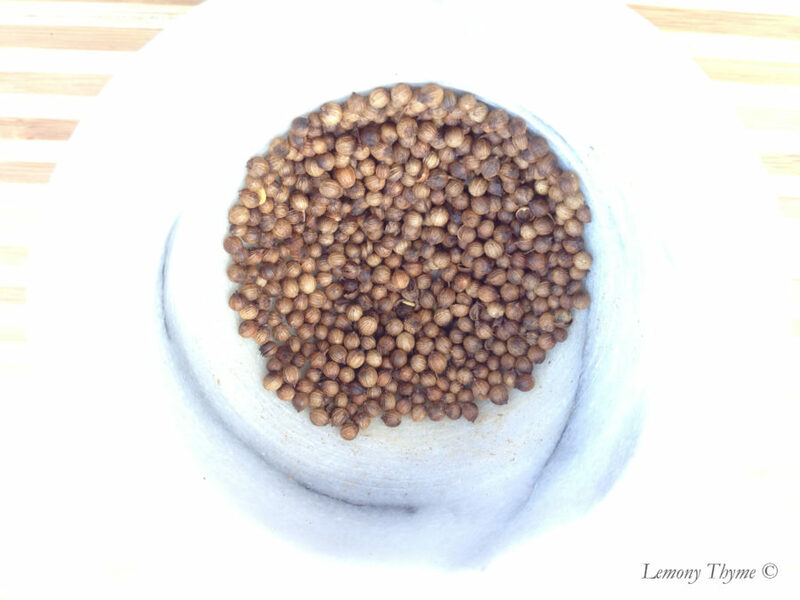 I bought three spices that day, cumin seeds, coriander seeds, and cardamom seeds. You see, earlier that morning I had read my first ‘non-family/friend’ comment on Lemony Thyme. It’s hard to explain the feeling but I was a titch giddy. Perhaps it’s like being in high school and having a crush on the most popular kid in school, who doesn’t even know you exist. Then one day, out of nowhere, they greet you by name. What?! Me, you know my name? And my mother didn’t put you up to this? It’s the kind of thing that can make your day or for me… changed my cooking life. Here was that comment as posted on our North African Lamb Kebabs recipe: I found your site looking up Patty Pan squash. Wonderful recipes, photography and blog. If making this lamb recipe again, may i suggest lightly toasting and then grinding your cumin and coriander from whole seeds? (mortar & pestle or coffee/spice grinder). You would not believe the difference in depth or flavor. I found this out myself when learning Indian cuisine from Laxmi Hiremath’s book “The Dance of Spices” and will never go back. I get my seeds from an Indian grocery store. Can’t wait to try your recipe/s. Cheers! And here was my response: Thank you so much for visiting Lemony Thyme and for the spice suggestion!! I have been so focused on getting to know my fresh herbs that I’ve neglected the ‘spices’ in my recipes. You’ve inspired me. I think my winter focus will be just that….spice exploration. And I’ll start by checking out “The Dance of the Spices.” Thanks again and please share if you try any of our recipes. I’d love your feedback. Cheers! And so Winter Thyme Spice Exploration was born. That evening when I came home from my Sundays with Shelby outing to Penzey’s I promptly toasted my coriander seeds, ground them fine and added them to this wonderful African Chicken Peanut Stew. Today we decided to elevate this dish and turn it into African Chicken Peanut Stew Pot Pies (anything served in pie crust gets high marks in this house). I’ve said before, I’m a big fan of ready-made pie crusts. They’re so versatile…you can even braid them. Side note: does the above picture feel upside down to you? Or you can cut fun shapes to decorate your pies. This time around we slightly modified the original recipe, found on Simply Recipes, according to ingredients on hand. We replaced the chicken legs and thighs with boneless breasts, added new potatoes in addition to the sweet potato, and kicked up the heat by increasing the cayenne and black pepper. The end result is a hearty flavorful stew with hints of ginger and peanuts and warmth and goodness. I have eaten it hot in a bowl like soup…incredible. I have had it over a bed of couscous which was delicious. I’ve eaten it cold for breakfast, the best way to appreciate true flavors….divine. And now I’ve enjoyed it from a flaky pie crust bowl and I am in heaven. If you have yet to dabble in African cuisine I can’t tell you enough how much flavor you are missing out on. I’m so hooked I’ve added a new Moroccan/North African Category to Lemony Thyme. And while this African Chicken Peanut Stew is West African inspired it falls nicely in this category. In a large soup pot or dutch oven, heat oil over medium-high heat and saute the onion for 3-4 minutes, add the ginger and garlic and saute another minute. Add the potatoes and stir to combine. Add the chicken breasts, chicken broth, diced tomatoes, peanut butter, peanuts, coriander and cayenne and stir well to combine. Bring to a simmer, cover the pot and simmer gently for 90 minutes (check for chicken doneness after an hour). When chicken is done and potatoes are tender remove from heat. Remove chicken pieces and shred or chop and return to pot. Taste for salt and pepper and add in as much black pepper as you can stand. The dish should be peppery. Then stir in fresh cilantro. Line individual baking dishes or one pie plate with ready-made pie crust and prebake for 5 minutes. Fill dishes with prepared stew, add a top crust or adornments, and return to the oven for 20 minutes or until pie crust is golden brown. Allow to rest 5 minutes before serving, sprinkle with fresh cilantro leaves. I lived in Namibia for a while as a volunteer and had some not so great experiences with peanut curries. 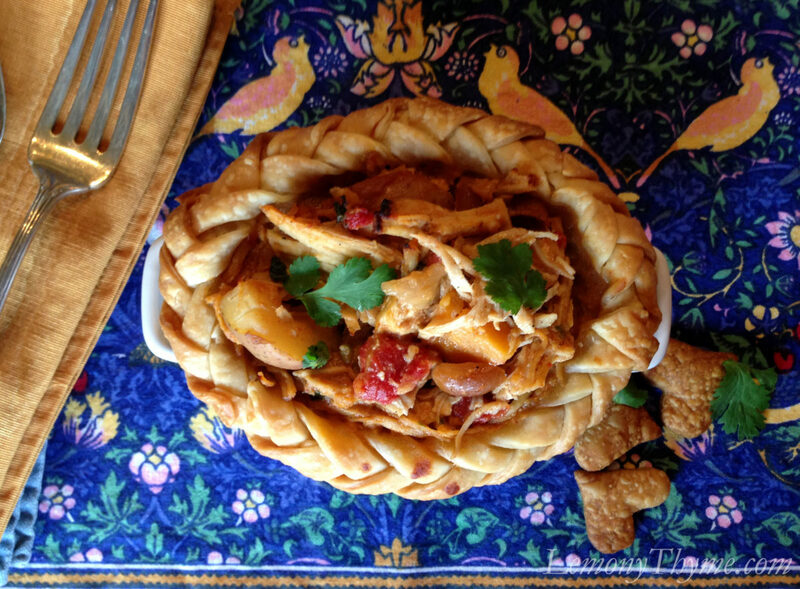 But this looks amazing and I love curry when it is incorporated in a pie. Such a great idea! Thank you so much Caroline and welcome to Lemony Thyme. I appreciate you stopping by for a visit.